Because I seek Dublin charm, inside and out. Dublin Castle, the Guinness Storehouse, Temple bar; the best of Dublin is a short walk away. The stylish apartment in the middle of everything. You will love the charming decor. Polished wooden floors, fashionable furnishings, and a gorgeous L-shaped sofa. There is even a feature fireplace. Nice. We think it’s ideal if you need to be central. Trinity College and Liffey College are close by, and after a hard day you won't struggle to find a good old Irish pub. The open plan living and dining room. The chic decor. Love the archway to the kitchen. The Old City charm. This is the location. The bedrooms aren't huge. But, in a location like this you probably won't be at home much. This is a charming 2-bedroom apartment on Bertram Court, Dublin. It boasts a chic decor, and a stylish open-plan living and dining area with a big comfy sofa. This apartment is perfect for anybody. Live central, with the best of Dublin right outside your door. Relaxing in the beautiful bright living area – that sofa looks like the nap spot. Showing off your new pad – dinner party? Getting rowdy with the locals at the famous Temple Bar – you've gotta go once. 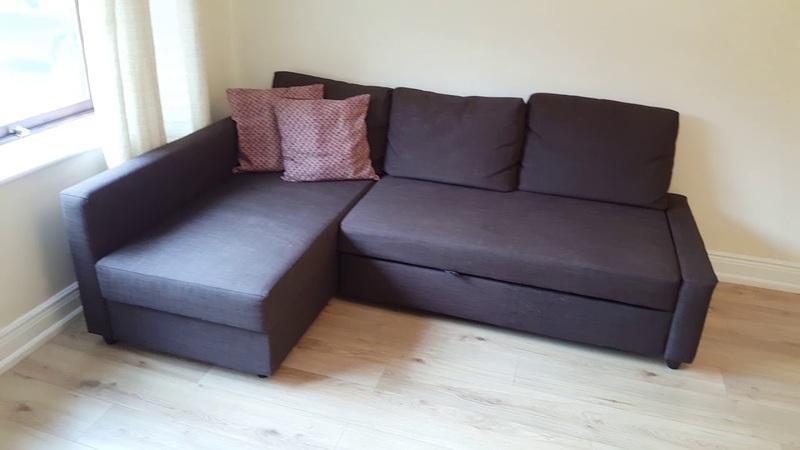 The sofa in the living room can be used as a bed; ideal if you have guests.